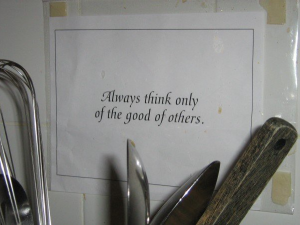 Originally published on The Shambhala Times, May 21 2014. When I ask myself, “what has been helpful in my life” or “when was I really being transformed by the Shambhala teachings”, my mind immediately flashes to my time as a staff member at Dorje Denma Ling. I lived there for a year and half, and it’s one of the most tangibly valuable things I’ve ever done. I wouldn’t say that my mind is completely “calmed” or “tamed” as a result of my time there, but I can confidently say that I know myself far better than I did when I arrived on the land, and that the connection I made to tenderness and vulnerability continue to wake me up. It’s with this deep affection and appreciation for Dorje Denma Ling that I write this little article, with the hope that others might be inspired to serve the community and themselves by staffing and volunteering at a land centre, and Dorje Denma Ling in particular. Life at land centre, especially Dorje Denma Ling, isn’t conventionally luxurious. The land is rugged and there’s a lot of work to do. It’s also a small community, and I certainly found it all too easy to get annoyed over all sorts of things. But looking back, I wonder whether that’s really so different from life elsewhere. In Canada’s Maritimes we’re known for either complaining about the rain and snow or the intense heat. And relationships with people and working with our own minds is aways a challenge. So why do I remember all this being so much more vivid and intense while I was at Dorje Denma Ling? I think part of it is because I wasn’t running away. In the city, we can decide to just avoid or give up on someone who rubs us the wrong way. This isn’t possible at a small land centre. You have no choice but to relate to others, and ultimately, yourself and your own neurosis. I do my best to hold this view in the city, but it’s different. It’s missing the magic ingredient of a land centre. And that’s that everyone is in the same boat, having committed themselves to really try to “get to the bottom of things.” “Why did we get annoyed at each other? What do you think? What do you feel? What do I think? What do I feel? How do we make this work? How do we make this better?” Such a situation might seem claustrophobic, but nonetheless it’s profound and transformative. My life, before or after my time there, has never afforded me so little opportunity to hide and so much opportunity to open up. 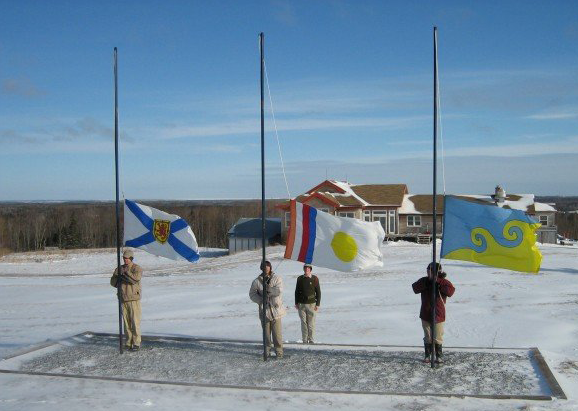 Raising the flags in heavy wind. Photo by Rhonda Newcombe. Another key element of the land centre experience is immersion. If you want to learn a language, surround yourself in it. If you want to be processed by the dharma, go to a land centre. Personally, I find the greatest obstacle to waking up is simply not remembering to wake up, not remembering to apply what I’ve learned. Whether that’s the antidotes to the kleshas or the obstacles to the paramitas, remembering to really live the dharma is easier at a land centre. First, you’re practicing and studying all the time, be that in the morning and evening chants and meditation, the weekly staff classes and other other study groups, your particular job, or in your other free time. Second, we remind each other. I remember so many occasions where one person would shift their body, straighten up, brighten up, and really radiate gentleness, and everyone in the room would just “come back”. I would get a little grin in my heart, and some part of me with with a good sense of humour would acknowledge that I had forgotten to create good society and that right now would be a good time to try again. Wash, rinse, and repeat for days, months, years, and lifetimes. These reminders wear away our desire to escape and acclimate us to vulnerability and spontaneity. And that immersion has a lasting impact, long after you’ve finished your stint as a core staff member or volunteer. The most content and genuinely happy I’ve ever been in my life was my time at Dorje Denma Ling leading up to Sutrayana and Vajrayana Seminary (now Enlightened Society Assembly and Sacred World Assembly). I was practicing and studying with such inspiration. I was marinating in dharma, absolutely in love with the teachings, pouring over transcripts from the Vidyadhara and the Sakyong. I didn’t have much time for my friends, which brought poignant tenderness and preciousness to the whole situation. Everything evoked teachings: “Good and bad, happy and sad, all thoughts vanish into emptiness like the imprint of a bird in the sky!” Intensely immersed, Dharma seemed to finally penetrate this hard head and hard heart of mine. Entering Dorje Denma Ling. Photo by Rhonda Newcombe. Dorje Denma Ling is doing some truly remarkable things right now, and that means they need more help than usual. Some of us might have the time to volunteer for a few weeks or months, and that would be incredible. But even if you only have a few days, that would be of great help, especially if you have some of the specific skills we need most. Let me elaborate on what’s happening at Dorje Denma Ling. They’re continuing on their big projects from last summer, and forging ahead with more. On the continuing front, there’s still work to do to finish Atlantic Canada’s first hempcrete (hemp-lime masonry) building and the gorgeous new shower house. They’re also planning on building some cabins in the woods above the main field, which will also mean creating a trail system. Very soon, work will begin on a root cellar addition to the main building, which will allow us to buy our winter veggies from local farmers and to cut down on expensive refrigeration. And of course, there’s much more, including the day to day needs and yearly activities, like maintaining and expanding our garden and, of course, hosting retreats. I also want to mention, because I’m personally in awe, one easily unappreciated project from last year. Dorje Denma Ling laid the plumbing and electrical lines for the next several decades of development -maybe all the development we’ll ever do. That’s tremendously important and obviously expensive. But it’s far, far cheaper to do it all at once than to make patchwork extensions every time we’re ready to make another building. This took a lot of long-term vision. And it’s that vision, exemplified by this project as well as all the sustainability/resilience-focused projects, that inspired me to share my experience of living at a land centre and to ask everyone to consider lending a hand at Dorje Denma Ling. 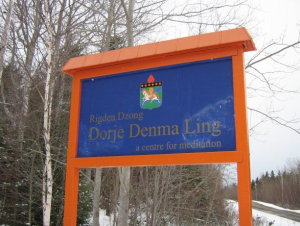 If you or someone you know might be interested in deepening your training and serving the community by living at a land centre, please consider contacting Dorje Denma Ling. Right now there are open positions for Office Manager, Head of Practice and Study, Finance, cooks, and in facilities. They’re also looking for volunteers to help with sustainable development, facilities, the kitchen, and housekeeping. If you have time and/or skills to offer, please get in touch. I will surely be helping them out this summer, and I’m looking forward to seeing you there! 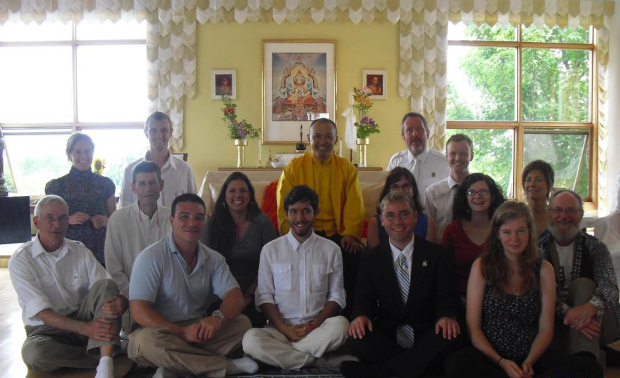 The staff of Dorje Denma Ling, meeting with Sakyong Mipham Rinpoche. John “Nyima” Wimberly. Photo by Will Perkins. John “Nyima” Wimberly, a second-generation Shambhalian, lives in Halifax, where he works part-time for Dorje Denma Ling and as a freelance painter, writer, and researcher. 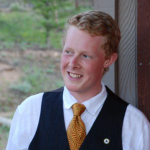 He’s lived as staff at both Dorje Denma Ling and Shambhala Mountain Center. 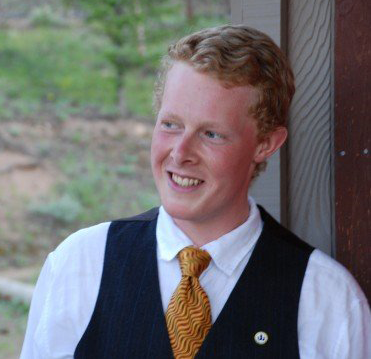 His “free” time is spent engaging in activism, politics, and otherwise working to create good society on Earth.